You are here: Home / artist to artist / How Does Your Art’s Subject Shape the Process of Making It? How Does Your Art’s Subject Shape the Process of Making It? Periodically, we pose questions to artists about issues they face in their work and lives. We were curious about the relationship between an artwork’s subject and its form, materials, structure, and process. We asked artists, To what extent is your art-making process shaped or impacted by your work’s subjects? For me, half the work of writing is creating an organic relationship between a piece’s subject and its structure. Every so often, I’ll hit on both at the same moment, and that work tends to flow quickly. But more typically, I start writing before I’ve found the right form. With my memoir, for example, I wrote for years knowing that I hadn’t found the right structure. I was getting the story down, but it didn’t have a strong momentum. Only when I hit on the form of a glossary did the writing take off in a more vital, energetic way. The idea that form is a “container” has led to a lot of confusion for me because it’s very static. I no longer think of it that way. Instead, I think of the search for form kind of like trying to find the right shoes for a long walk… If your shoes are too tight or too heavy, you won’t get very far. But if you find just the right “shoes” for a given subject, they will let you go wherever you need to go to tell that particular story. Objects, made or found, are tied to their composition, former uses, and future selves. An artist’s role is to tease these connections. We perform this magic, revealing what is already there, as if we discovered it. In Service Station I crafted a container with a vintage gas station hand towel at its core. 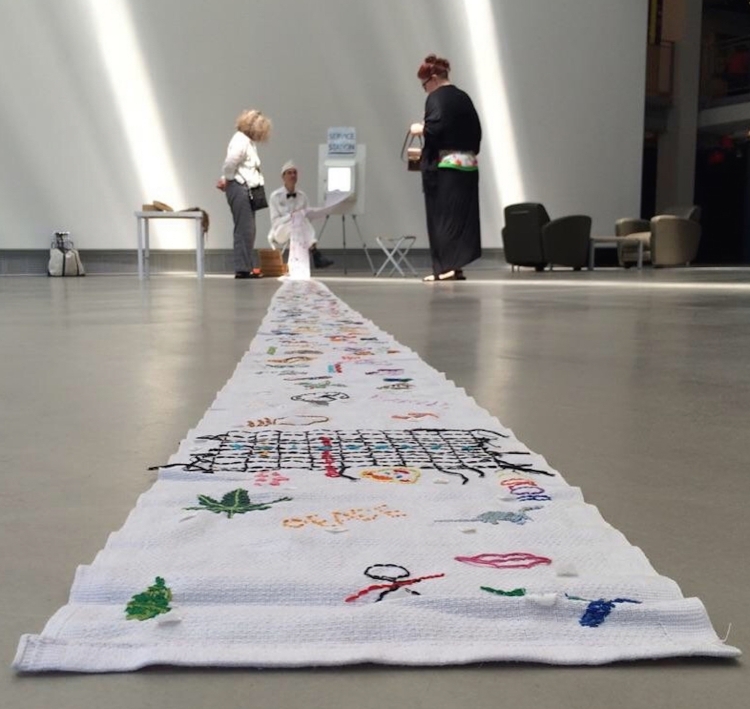 The embroidery done on it by me and participants is both an artifact and tool to elicit a deep conversation about what is missing in the world. The act of speaking with a needle is slow and the answers take on the comforting nature of anything hand made with care. I could speak of homemade modernism, the dream of the automobile and the dignity of service, all of which are embedded in these simple objects. The power is also in the reversal of turning a dirty hand towel into something beautiful. It is a tangible metaphor for turning our own sense of hopelessness and powerlessness into caring and action. And at the start in 2015 it was empty and now having traveled to ten cities, been touched and worked by hundreds of hands, it is filled with the stories and lives of people from many backgrounds. I believe that form and subject are inseparable. My composite portraits are constructed from individual components made at different moments in time, usually years apart. There are (at least) two levels of subject matter at work – the presence of the people being photographed, and the passage of time. I develop the sense of human presence by asking my subjects not to smile, keeping backgrounds as simple as possible and printing the final composites quite large (44″). Regarding the passage of time, I take the simple structure of “before and after” and explore it, trying to bring the images together in a way that feels simultaneously double and single in form. This involves attention to the relative size and placement of each component, and the boundary between them. Converting all images to black and white enables smoother transitions. While maintaining a strict movement from earlier components (on the left) to more recent ones (on the right), I nevertheless aim to suggest a kind of circular time. The viewer is invited to move back and forth between what came after and what came before. Once the composite images are carefully constructed, their meanings unfold best over extended or repeated viewings, with viewers adding their own elements of presence and time. Kim Adrian‘s memoir The Twenty-Seventh Letter of the Alphabet will be published September 2018, and she is editor of The Shell Game: An Anthology of “Hermit Crab” Essays (April 2018), both from University of Nebraska Press. 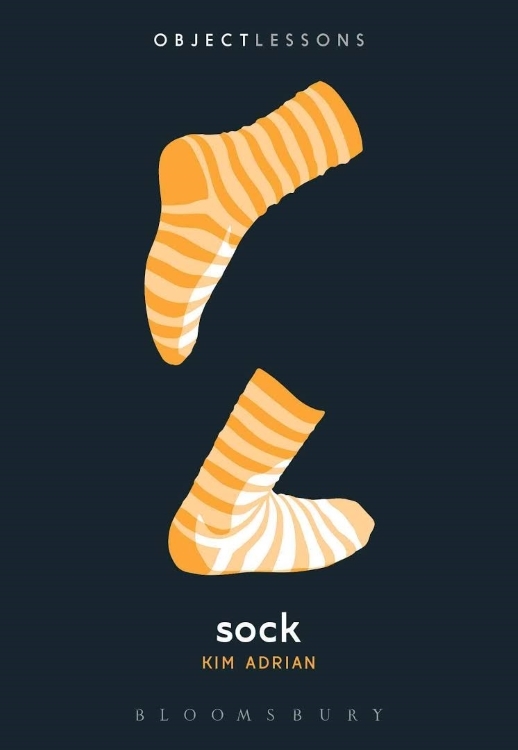 Her new book Sock will have its launch event at Brookline Booksmith (9/7, 7 PM). Find other events. William Chambers is artist in residence at Clark University fall 2017 and is the Visual Arts Chair at the Bancroft School. His work has been exhibited nationally in art museums, galleries and on street corners and is held in private collections on both coasts. His performance pieces have been featured at the ICA, the Mattress Factory, and the American Visionary Art Museum, among others. Sandra Matthews has photographic work in an upcoming group show Self Indulgence at Hampden Gallery, University of Massachusetts (9/10-9/29), curated by Sally Curcio, D. Dominick Lombardi, and Anne Laprade Seuthe. She will be giving a talk, entitled “Photographic Portraits: Private Meets Public,” about the ways that portraits engage with history, 9/9 at Historic Northampton. In addition to working as an artist, she is editor of the online journal Trans Asia Photography Review (fall 2017 issue available early November). Images: cover art for SOCK by Kim Adrian (Bloombury 2017); installation view of William Chambers’ SERVICE STATION (2016), an interactive embroidery installation; Sandra Matthews, CLIFF IN 2012/CLIFF IN 2016 (2016), photographic collage/inkjet print, 30×40 in.